The infinite potential of human consciousness and spirit is the subject of Alex Grey’s art. Like the visionary English artist William Blake, who expressed in image and word that “everything that lives is holy,” Grey’s main subjects are cosmic energy, love and the universal human journeys taken by our bodies, minds and spirits. Alex Grey’s paintings, photographs, prints, books, films and other devotional works depict in lovingly precise anatomical detail how the human body and energy systems such as the chakras and nadis are actually pathways for divine consciousness to express itself. Devoid of any religious agenda, Grey’s images show viewers that every human is wired by the universal life force to transmit and receive divine energy. Depicting the physical unity and electromagnetic energy flowing inside of and between people praying, meditating, practicing yoga, kissing, making love, breastfeeding, etc., Grey’s paintings invite the viewer to imagine and make manifest his or her most invisible, most essential and vital dimensions. In his 1984 oil on linen painting “Praying,” for example, a man’s inner anatomy is lit from within by a sun in his heart and a sun in his mind. From the light in the center of the brain, a halo emanates and surrounds the head. Like all successful art, “Praying” inspires awe. The painting’s transdenominational expression of human spirituality contributes to the art historical dialogue by showing us in a startlingly unifying way that all religious traditions flow from the same spiritual energies. With a life-affirming, non-religious agenda, “Praying” reminds us to embody sacred energies so that we can serve the entire human family rather than just those whose faith we may share. Based in New York, Alex Grey and his wife Allyson founded and direct the nonprofit Chapel of Sacred Mirrors (CoSM), which houses a series of life-size paintings of men and women of various races who embody aspects of divine consciousness. This series is called “Sacred Mirrors” and has been exhibited in various museum. The works are further distinguished by elaborate frames that the Greys sculpted and cast themselves. CoSM is a transdenominational chapel where people are welcome to visit, and the adjacent CoSM gallery features regularly rotating exhibitions of transformational art. Grey and his work have entered the mass mindstream in a major way. 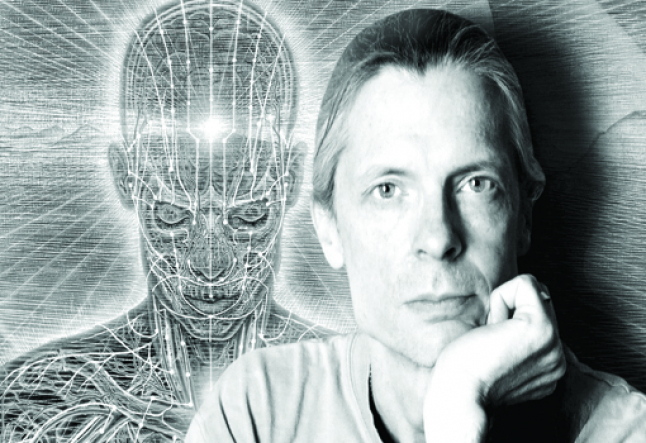 Alex Grey has created immense banners for rock band Tool’s concert tours, as well as produced artwork for many of the group’s artistically and commercially successful CDs. He has earned admirers such as philosopher Ken Wilber – who contributed an essay on Grey’s visionary art to the book Sacred Mirrors – and the late, great American curator and collector Walter Hopps.